For any season, I need more tops in colours which work with my skirts and trousers and and which are, ehm, not black. 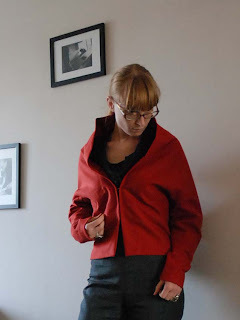 Somehow, I seem to focus mostly on sewing jackets and dresses with trousers and skirts following at a respectful distance (measured in time spent sewing, that is) and tops only come a sad fifth. Oh, I went through a phase of sewing button-downs from Knipmode, way back in the days before pattern making. And I made a few more blouses from my own patterns back when I had the sewing machine which would eat all thin fabrics and all jerseys. And some very basic t-shirty things when I just had my serger.By now, the Knipmode shirts have all been retired, most of the other blouses still get worn occasionally, but they're all black. The t-shirts are good for layering but too cold for autumn and winter. So, to make a long story a little bit shorter, I made a top. From moss-green jersey. It's got a twist in the bust area (as seen in Pattern Magic 1) but also a dropped shoulder. It is super comfortable and although it doesn't look great with my usual benchmark garment, the mustard yellow pencil skirt (the colours don't really like each other...) I really like it with my 'new' (bought second-hand, originally to re-use the leather, and then I found out it fit me perfectly) red skirt. For those of you who are interested in that kind of thing, this is what I did to the shoulderline: I raised the shoulder itself by 0.5 cm and extended it quite a way. 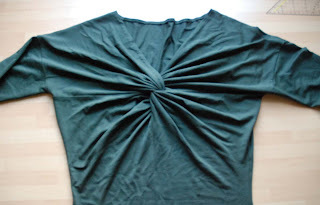 Then, starting at a right angle, I made a shape which joins the original fitted t-shirt shape at the waistline. This alteration provides extra ease at the top while keeping the overall shape and look of a fitted top. Which works quite well for a small-busted girl like me. To go with this, I drafted a very simple sleeve: symmetrical for the bottom part and with almost no sleeve head at all. Look, I've made 'wearing a square'! Those of you who are familiar with the Pattern Magic phenomenon will notice this one instantly. 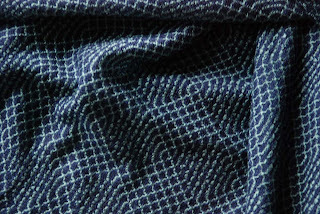 After all, it is one of the most made designs from Pattern Magic 2, judging by its appearance on Burdastyle. However, I thought this would be just the kind of design for me. 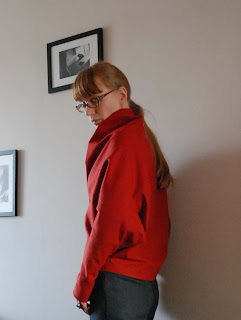 I had been pondering my options for making an 'object' kind of jacket for a while when I realised 'wearing a square' would be perfect for that. I ignored the book's suggestion that this would work well in a stretch fabric. I was envisioning this more as a real jacket. It's made from this woven red mystery fabric (which contains both wool and polyesther) and it's lined. And I didn't put in a zipper but applied three hooks and eyes instead. I like how the top of the front forms a big collar this way. I drafted my own square based on my normal sloper and made slightly wider sleeves. This is an important detail: I have skinny arms for a Dutch girl but in a non-stretch fabric the 10 cm for half of the sleeve which is indicated in the book would be uncomfortably tight. The sleeve is on the bias, but this lining doesn't gain much stretch by that. All in all, I love this little jacket. I'm glad I tried it out in a cheap fabric but I am slightly worried it may not last long (it's already starting to pill on the sleeves. but on the other hand, some fabrics start doing that early and then stop...). Which would be a shame because I love the colour. I've got more of it which I will use. A couple of weeks ago, fellow Dutch blogger Sigrid contacted me. She told me that she was planning a meeting for sewing enthousiasts. Here, in the Netherlands. Most of these ladies knew each other through Pattern Review (which I never look at, since I don't buy patterns) but they were also interested in meeting other people who shared the same hobby. Now, I'm always reading about these meetings happening in say, New York and sometimes in London, but I've never had the opportunity to take part. So, obviously, I was interested. The meeting was last weekend. 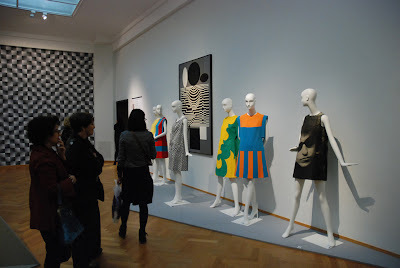 We visited the Fashion loves Art exhibit at the Gemeentemuseum in Den Haag and after that we went to Amsterdam. There, we visited lingerie-sewing emporium Kantje Boord and then went to Valerie's house. We had a fabulous dinner and after that, there was an 'ugly fabric swap'. Apperently, this is standard issue at PR weekends, but what do I know about that? Anyway, it was a lot of fun and I actually like the fabric I ended up with. Next year, when summer is coming, I think I'll make a dress out of it. It was great day. Even though I didn't join the others in visiting the fabric market on Sunday (I really should be on a strict fabric diet, that's why), it was great to meet so many nice people who love sewing. Thank you so much for inviting me along ladies! See, I still try to live up to my promises! In this tutorial, I'm giving you the dimensions I used. Although this is not a fitted garment, different people would need different sleeve lengths and on larger sizes, this cardigan would end up sitting higher on the body, so size can matter. You can of course size it up a bit and/or change the dimensions. This would require cutting the body piece on the crossgrain and having two seams instead of one in the front-and-neckline band. In a fourway stretch fabric, that's fine. 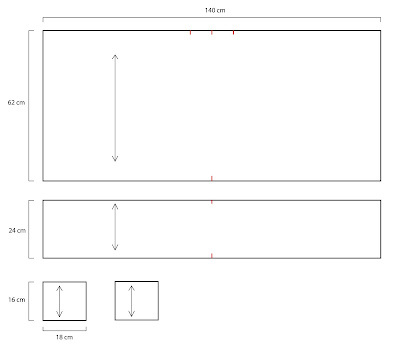 Just a bunch of rectangles (in case it's hard to read the print on the picture, both big ones are 140 cm wide, the top one is 62 cm high, and the bottom one 24 cm. The small pieces are the same: both 16 cm high and 18 cm wide). 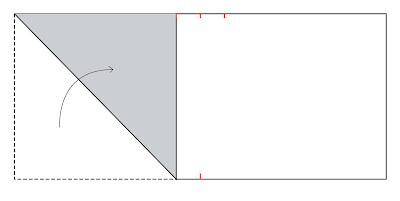 Cut one of each with the straight grain as shown by the arrows in the drawing. 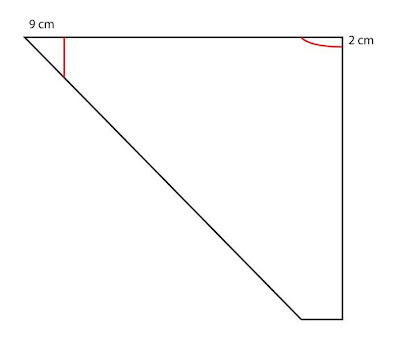 Make sure to mark the middle of the big pieces and the top of the biggest one, make additional notches at 9 cm to either side of the center mark. 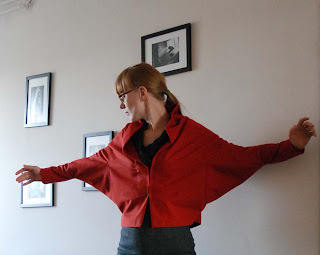 To make the cardigan, fold the biggest piece as shown and sew down along the top. Repeat this with the other side. 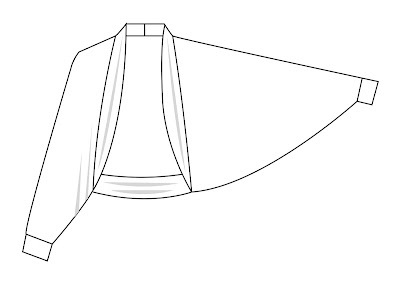 Fold the resulting object in half along the center line. Now, cut along the red lines: scoop out a back neckline of about 2 cm deep and cut off the points where they are at about 9 cm (better to do that for each separately, for accuracy). Now, it's time to turn your attention to the smaller pieces. 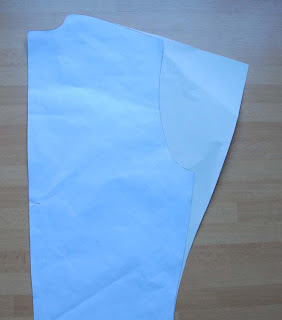 Sew them together along their vertical edges, fold the resulting tubes in half right side out and pin the big one to the neckline and front edge (with the seam at the back neckline and matching the center notches at the bottom) and the small ones to the arm. Each of these bands should be stretched a little to fit. I hope this is clear. If there are any questions, please let me know through the comments. 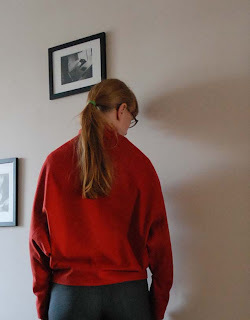 As ever, everyone is of course free to use this tutorial for personal sewing (but not commercially). An if you make anything using this tutorial, I'd love to see it! 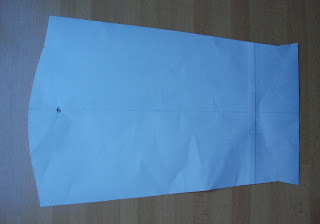 The good news is I have now printed the JJ sloper (which takes more planning than you'd think because my printer has refused service since I had its ink cartridges re-filled a couple of months ago). The bad news is that my mind is on anything but dresses lately... Bad blogger, Lauriana! In other news, I have been putting off posting about other things until I would have this draft-along thing well under way. I won't be doing that anymore. I still have every intention of getting on with the draft-along but not posting about other things makes this blog a lot more 'dead' than it has to be. So I'll have no more of that. As a first, let me show you this super-easy cardigan I made a week ago. This really is a very simple project but I really enjoy the look. It is also a great use for those thin, sheer drapey knits which would never really work as normal tops. I'll do a how-to for it this weekend, if anyone is interested.